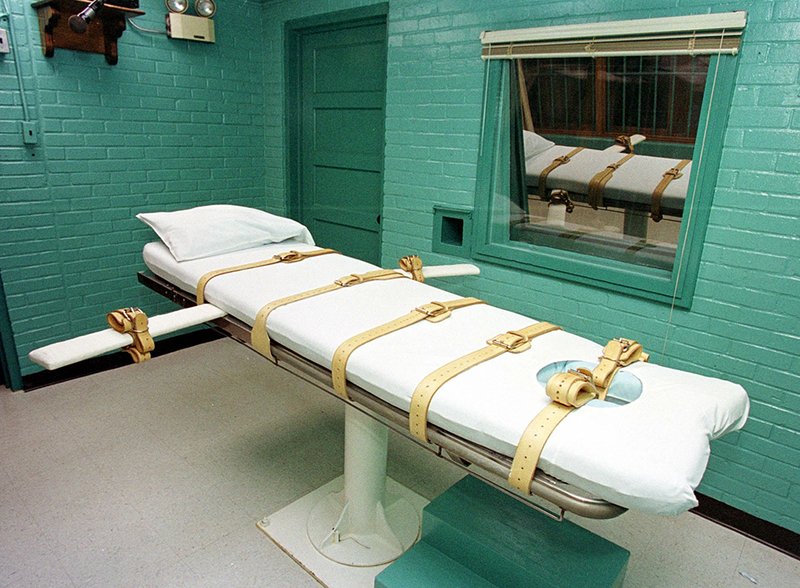 Texas Moratorium Network looks back on the top Texas death penalty news stories of 2015. 1) Alfred Dewayne Brown was exonerated and released after more than ten years on Texas death row for a crime he did not commit. He walked free and into the loving arms of his family and friends on June 8, 2015. “I went in an innocent man and I came out an innocent man,” said Brown. He has been placed on the Death Penalty Information Center’s Innocence List as Exoneree #154. Lisa Falkenberg, a columnist for the Houston Chronicle, took notice of Dewayne and wrote a series of articles concerning Dewayne Brown and the Harris County grand jury system. On April 20, 2015, she won the Pulitzer Prize for her series. Dewayne Brown and his daughter soon after his release. Dewayne has flourished since his release. He has re-united as a free man with his daughter. He has a job now. He enjoys taking care of his horses. He has traveled to speak about his case in Washington, D.C and in Austin at a press conference we held on October 24. 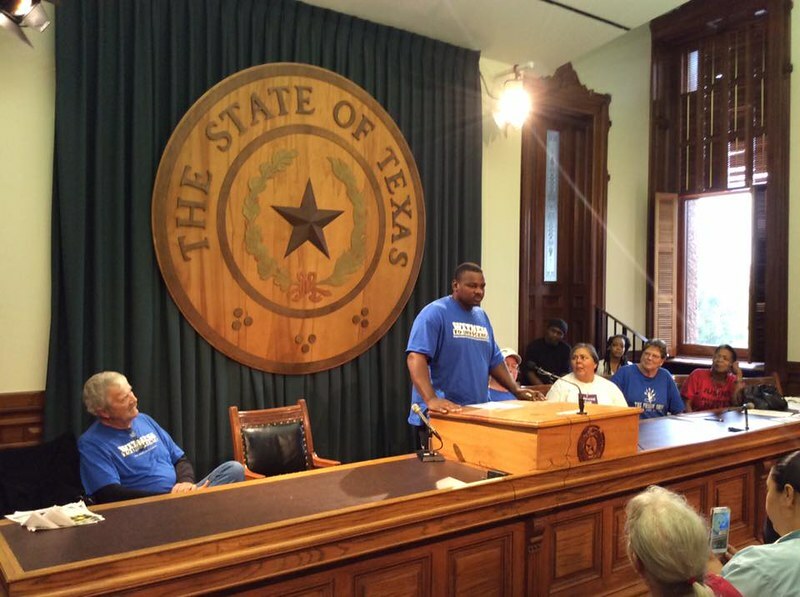 Dewayne Brown at press conference at Texas Capitol October 24, 2015. Dewayne enjoying the country life with his horses. Dewayne spent 12 years, 2 months and 5 days behind bars for something he had no part in. That is 4,449 days or 106,776 hours of his life that was stolen from him. Nearly every one of those days were spent in solitary in a cell no larger that a small bathroom. Together with other friends, Texas Moratorium Network created a fundraising campaign for Dewayne and raised a total of $6,775 to help him readjust to life in freedom . The donation page is still active, if anyone would like to donate to him. He has not received any compensation from Texas and it may be a long time, if ever, that he gets compensation from Texas. This is a typical cell on Texas death row where Dewayne lived in solitary confinement. 2) There were only three new death sentences in Texas in 2015. In 1999, there were 48 people sentenced to death in Texas (“Where is the Texas death row class of 1999 now?” by Eric Dexheimer , Austin American-Statesman, September 9, 2015). Texas went all the way into October before anyone was sentenced to death in 2015. It is remarkable that death sentences in Texas have gone from 48 in 1999 to only 3 in 2015. It shows that more and more Texans are rejecting the death penalty, not only in their private opinions but in their capacities as members of juries who vote against death sentences and as prosecutors who decide not to seek the death penalty in specific cases. If we can cut death sentences down from 48 to only 3, then we can eventually cut them down to zero. As the number of new death sentences continue to decline, the day is coming when the U.S. Supreme Court will step in and decide that the death penalty is unconstitutional because of the 8th Amendment protection against cruel and unusual punishment. Death sentences have been steadily declining in the U.S. over the past 15 years. “The use of the death penalty is becoming increasingly rare and increasingly isolated in the United States. These are not just annual blips in statistics, but reflect a broad change in attitudes about capital punishment across the country,” said Robert Dunham, Death Penalty Information Center’s Executive Director. While new death sentences declined in Texas to only three in 2015, the state continues to lead the nation in the number of annual executions with 13 in 2015. Yet, only six states in the entire nation conducted any executions in 2015. Eighty-six percent of executions this year were concentrated in just three states: Texas (13), Missouri (6), and Georgia (5). Since the death penalty was reinstated in 1976, Texas has executed 531 people (as of the end of 2015), more than the next six states combined — Oklahoma, Virginia, Florida, Missouri, Georgia and Alabama. Executions have become a predominately Southern punishment, which bolsters the argument for the Supreme Court to rule it unconstitutional. 3) Texas State Senator Eddie Lucio, Jr files historic first-ever bill in Texas Senate that would completely abolish the Texas death penalty. This was the first time a state senator has ever filed legislation in the Senate to completely abolish the death penalty in Texas. It happened because organizations in Texas held the Statewide Texas Lobby Day to Abolish the Death Penalty on March 3 and death row survivors Ron Keine and Sabrina Butler from Witness to Innocence and Scott Cobb of Texas Moratorium Network met with Senator Lucio’s general counsel and requested that Senator Lucio file abolition legislation. Here is a report from the Austin American-Statesman on the lobby day, which was widely covered in the media, including the Dallas Morning News, potentially reaching hundreds of thousands of people in Texas with our message. Many groups and people from across Texas participated in the Statewide Lobby Day to Abolish the Death Penalty, including Texas Moratorium Network, Texas Death Penalty Abolition Movement, Campaign to End the Death Penalty, Students Against the Death Penalty, and Witness to Innocence. State Rep. Harold Dutton has filed an abolition bill in the Texas House of Representatives every session since 2003. In addition, State Rep. Jessica Farrar began filing a separate abolition bill several years after Rep Dutton led the way. 4) Lester Bower, who had a strong case of innocence, was executed on June 8, 2015 after 31 years on Texas death row. He spent more time on death row than any other person executed in Texas. Bower maintained his innocence to the end. According to Jordan Smith of The Intercept, “serious questions remained about the state’s investigation and prosecution of Bower. Indeed, in 1989, some five years after Bower was sentenced to death, the conviction began to unravel. Documents challenging the state’s case surfaced — thanks to the dogged work of Bower’s pro bono attorney team — and a woman came forward to say that she knew who killed the four men, and that it wasn’t Bower. She has maintained her story — corroborated by others — for nearly 26 years. (For more background and recent revelations, read The Intercept’s earlier story on the case. )”The potential for an innocent person to be executed is far from remote — and not just in Texas. Also see, “Did Texas Execute an Innocent Lester Bower?” in Politico.com. The judge who heard the new evidence said in 2012 said “…the new evidence produced by the defendant could conceivably have produced a different result at trial,”, but he said it did not warrant a new trial, because “…it does not prove by clear and convincing evidence that the defendant is actually innocent”. The ruling illustrated the dilemma for defendants. “He [Judge Fallon] points out in pretty clear terms that this guy probably would have been found not guilty had this evidence been available at trial,” Maurice Possley said. 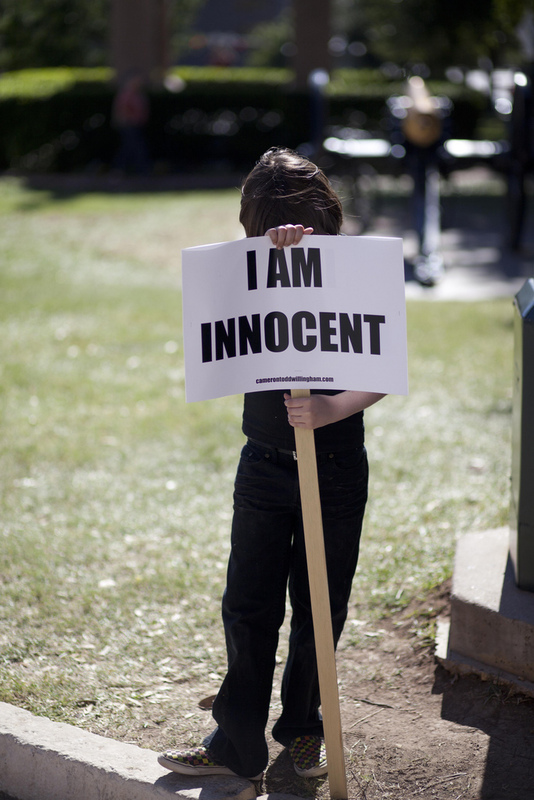 “But now, all these years later, he can’t meet the new standard, which is actual innocence. That was not the standard at trial. Then it was guilty beyond a reasonable doubt. Bower joins a disturbingly long list of people executed by Texas who may have been innocent, including Todd Willingham, Carlos DeLuna, Ruben Cantu, David Wayne Spence, Shaka Sankofa (born Gary Lee Graham), as well as others (DPIC list). The Texas Observer also took up the issue of solitary confinement in an article on March 16, 2015, “Letters from Death Row: Alone on the Inside“. In that article, Texas death row inmate Thomas Whitaker is quoted saying that long periods of solitary confinement can result in loss of speech. “When you live in an environment where nearly everyone is hostile to you, you learn to say less and less until you arrive at the point where vocalization seems increasingly odd to you,” he wrote. The article says that “depression and other forms of mental illness are not unusual for inmates on death row. In Texas, a quarter of inmates facing execution, and therefore held in solitary confinement, have been diagnosed with either a serious mental illness or intellectual disability. But the Observer found that prisoners often choose a life of permanent isolation, refusing to leave their cages. It’s a catch-22: Mental illness can lead inmates to never leave their cells, never leaving their cells can exacerbate—or even cause—mental illness. 7) Rodney Reed was issued a stay of execution on February 23 by the Texas Court of Criminal Appeals, less than ten days before his scheduled execution date of March 5, so new evidence can be considered that Reed’s attorneys say proves their client’s innocence. So far, no new execution date has been scheduled. Rodney’s father, Walter Reed, a Bastrop native and retired Air Force veteran, died March 27. He was 72. Later in October, Reed’s attorneys filed a motion in Bastrop district court stating they have found new evidence of a previously undisclosed investigation of the fiancé of murder victim Stacey Stites. They say the new evidence points to Stites’s fiancé Jimmy Fennell as the killer. Rodney’s mother and brother, Sandra and Rodrick spoke at the 16th Annual March to Abolish the Death Penalty on October 24. The Campaign to End the Death Penalty continues to organize events to help Rodney’s family prove his innocence. Keep up to date on the We Demand Justice: Free Rodney Reed Facebook page. 8) Charles Sebesta, a former Texas district attorney, was stripped of his law license in June after a panel of the State Bar determined he withheld evidence and used false testimony to win a capital murder conviction against Anthony Graves, a now-exonerated former death row inmate. Graves, who faced two execution dates and spent more than 18 years behind bars for a crime he did not commit, including more than 12 on death row, said the ruling against Sebesta was vindication and quoted Shakespeare. “The worm has finally turned,” he said. “And it’s pointing toward justice now. It’s a good day.” As part of announcing the action, the State Bar also offered a statement on the egregiousness of Sebesta’s behavior. “Mr. Sebesta’s disbarment cannot begin to make up for what happened to Anthony Graves, but we hope it can bring him some sense of justice,” Laura Popps, deputy counsel for the Office of Chief Disciplinary Counsel, said in a news release. 9) Raphael Holiday executed in Texas on November 18 after appeals lawyers who were appointed to his case unilaterally decided not to seek clemency or pursue additional appeals and then opposed Holiday’s efforts to replace them with lawyers who would. 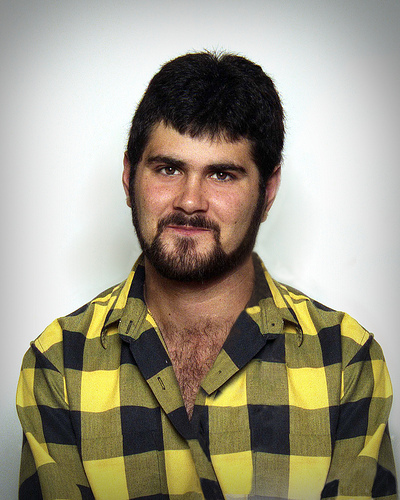 A month before his execution his lawyers sent him a letter informing him: “This marks the end of work for your appeals I regret.” The letter acknowledged the option to submit “a clemency petition to the Texas governor,” but they did not recommend that because, in their view, “a clemency petition just gives an inmate false hopes.” U.S. Supreme Court Justice Sonia Sotomayor wrote in a dissent that she agreed that the federally appointed lawyers had abandoned their client (pdf), saying that Holiday had been left to navigate the clemency process from his jail. Holiday’s clemency application may have benefited from “more zealous advocates,” she wrote. Read more at The Marshall Project from Gretchen Sween, an Austin lawyer who tried to help him after his lawyers had forsaken him. 10) Antonio Williams committed suicide in February. He became the 13th Texas death row inmate to commit suicide in the modern era. He had been sent to death row in 2007. Two witnesses whose testimony helped send him to death row had recanted their statements, saying they were pressured to lie by prosecutors and investigators. He was back in Houston to attend hearings for his appeals and was found dead in his Harris County jail cell early in the morning. His lawyer said an outside agency is needed to properly investigate the death. Success! We have reached and surpassed our initial fundraising goal of $5,000. Generous people around the world have so far donated $6,775 to the effort to help death row exoneree Alfred Dewayne Brown, who spent more than ten years on Texas death row before his release in June 2015. We expect as people continue to find out about Dewayne’s story they may want to donate to help him, so we are leaving the page live to accept donations. Every donation helps Dewayne rebuild his life and readjust to life as a free person. Thank you to everyone who has donated or helped spread the word to others. At the 16th Annual March to Abolish the Death Penalty on October 24, 2015 we presented Dewayne a giant check to represent all the donations received up to that point. Alfred Dewayne Brown spent 12 years imprisoned, including a decade in a solitary cell no bigger than the average bathroom, waiting for Texas to put him to death for the 2003 murder of store clerk Alfredia Jones and police officer Charles Clark. The case garnered worldwide attention when Lisa Falkenberg, a columnist for The Houston Chronicle, told the story of the corrupt justice system that put Brown away. The Indiegogo Life campaign for Brown set a 30-day goal of $5,000, and hit it with 57 hours to go. The march is still on as planned. If it is raining very hard Saturday in Austin, then we will move inside the capitol to a room we have reserved courtesy of State Rep Harold Dutton. Right now, meet on the South Steps at 2 PM as planned. If it is stormy, we will all go inside to the backup room, which is on the first floor of the capitol. It is called the Agricultural Museum, and the room number is 1W.14. Everyone please come! We have six death row exonerees coming, including Dewayne Brown, so come out to meet them all! This will be a great event, outside or inside! Six exonerated death row survivors will lead the 16th Annual March to Abolish the Death Penalty on October 24, 2015 at the Texas Capitol at 2 PM: Alfred Dewayne Brown, Ron Keine, Shujaa Graham, Sabrina Butler, Gary Drinkard, and Edward Mpagi. Come to the march and hear how the death penalty puts innocent people at risk of execution. In addition to these six living, breathing survivors of death row, some people at the march will carry photos of Cameron Todd Willingham, an innocent person executed by the State of Texas in 2004. After prosecutors reneged on all their promises to Weyer, she fully retracted her story in a set of taped newspaper interviews. According to Hutchison & Stoy, the story broke in January 1975, and a hearing for a new trial was held. Unbelievably, the judge refused to grant a new trial, and then the taped interviews with Judy Weyer mysteriously disappeared. Ron and his co-defendants remained on death row. 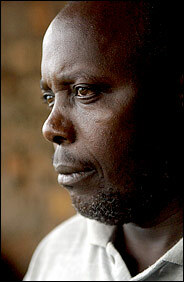 Edward spent over 18 years on death row, accused of killing a man who was later found to be alive. His family successfully campaigned for his release, providing evidence that the alleged victim was still alive. Sentenced to death for murder in 1982, the Attorney General proved that the man Edward was accused of murdering was still alive in 1989. However it was not until 2000 when a nine member presidential committee released Mr Mpagi, deciding he was innocent. Held for many years in the Luzira Upper Prison Edwad taught his fellow inmates to read and write. He became one of the longest serving inmates and a prison elder. Mr. Mpagi is now an advocate for the abolition of the death penalty and is a committed religious leader. A graduate from a Catholic Diocese he regularly tours prisons providing inspiration and hope toprisoners. He connected with Kathy Ozzard Chism at the all-volunteer nonprofit Dream One World, and together they are building a school compound for 150 of these orphans in Uganda, with the help of volunteer workers and donors from around the world. Todd Willingham was an innocent person executed by Texas in 2004.